These may not have been quite the exact same deliciousness of the burgers we had at the restaurant but they certainly satisfied my cravings. The beef was succulent when cooked medium [or medium rare] and the way the pockets of blue cheese melted in every bite was so good. The caramelized onions with a touch of red wine mixed into the burger itself added some wonderful depth of flavor, pairing nicely with the blue cheese. Then if that all wasn't enough, sautéed mushrooms give the burger just a bit of texture and bite. Oh my gosh, I'm salivating all over again just typing this out lol. 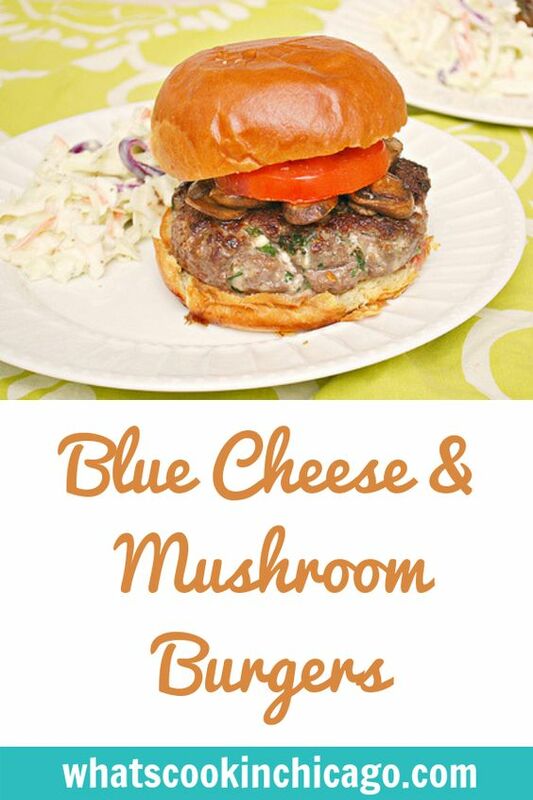 That said, make this if you love blue cheese, mushrooms and burgers. The combination is definitely a winner. Heat a large nonstick skillet over medium-low heat. Add 2 teaspoons olive oil to pan and add onion, garlic and thyme; sauteéing until softened. Increase the heat to medium-high; add wine, vinegar, and 1/4 teaspoon salt. Continuing cooking until most of the liquid evaporates, stirring occasionally. Transfer onion mixture to a large bowl and set aside. Wipe pan clean with paper towels and heat pan over medium-high heat. Add the remaining 3 teaspoons oil to pan along with the mushrooms and 1/4 teaspoon salt. Sauté until mushrooms brown and liquid mostly evaporates. Transfer mushrooms to a small bowl and set aside, keeping warm. Add beef, blue cheese and parsley to the bowl with the onion mixture. Divide the beef mixture into 6 equal portions, gently shaping each into a 1-inch-thick patty. Press a nickel-sized indentation in center of each patty. Sprinkle the patties with remaining 1/4 teaspoon salt. Place patties on a grill rack coated with cooking spray, and grill for 4 minutes on each side or until done. 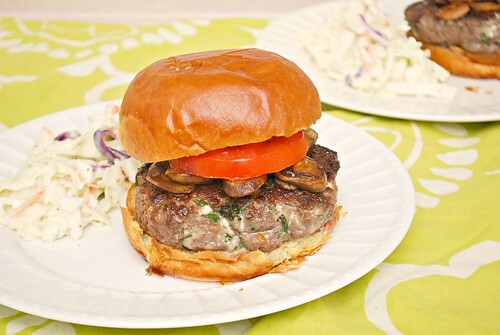 Serve beef patty inside a toasted brioche bun, topped with the mushrooms and garnish with your favorite toppings. This sounds really good, though cooking for 4 children it probably won't go over very well in our house, my kids are so picky these days. I have to admit, just reading it is making my mouth water. I think I have to pin this one. Yummy! Can't wait to try. I'm not a blue cheese fan, but I love mushrooms. The burger looks tasty. These look and sound wonderful. I'm not a fan of blue cheese, but the husband absolutely loves it! I should make this for him. I know he will love the combination of blue cheese and mushroom in his burger. I love that the blue cheese is in the burgers! Great idea. I can't wait to try this one with the mushrooms on top. This looks so good! I haven't really tried blue cheese before but after seeing your picture of this burger...I may just try it! Blue cheese and bacon burgers are one of my favorite kinds of burgers!